Searching for a free beginners guide to Final Cut Pro X? Need some insider knowledge to get the ball rolling and make your content look great? FCP Audio is one of the world’s leading providers of plugins for Final Cut Pro X. We specialise in giving our customers killer customisable audio for their videos and understand that not everyone knows the ins and outs of how Apple’s software works. 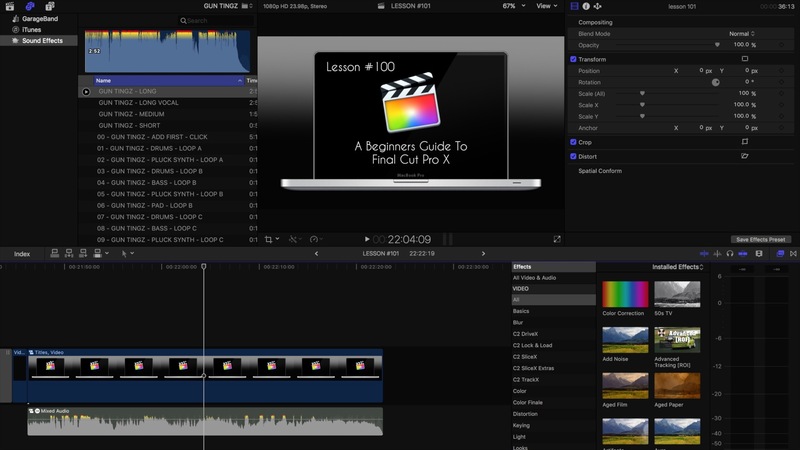 In this guide, we’ll tell you all you need to know to master the basic art of getting started with Final Cut Pro X. So, let’s get to it! If you haven’t already, start by downloading Apple’s 30 day free Final Cut Pro X trial. In this guide, we will walk you through the super basics so you can crack on with editing a simple video assignment from beginning to end. Visit the Apple Site and Download your free trial! It’s now time to visit the Final Cut Pro X free trial page. Fill in the basic details and download your trial. They’ll guide you through – so don’t panic. If it’s taken a while, that’ll be down to your internet speed – just stick with it. Now that you’ve successfully downloaded, it’s time to install. Click on your Final Cut Pro Trial .dmg file and let Apple guide you through the process. The Libraries Pane in the top left lets you manage and organise your events and libraries. When you launch this for the first time, Final Cut will open with an empty library. Off to the right of the Pane, you’ll spot the Media Browser. This lets you scroll through any media that has been imported if you want to add content to your video. As you sift through this, the Viewer will show on the right-hand side. And then we have the timeline, which lets you pull together your movie one clip at a time. Although they will show in sequence, you can trim and re-jig them as you please. If you click on the various buttons to the left of the Inspector, which allows you to change settings and various filters, (an icon which is located towards the far right of your timeline interface above your content) you’ll notice that a selection of options such as Titles, Music and Effects will appear. This will provide with lots of options to really bring your video alive. So there you have the basics! In this article, we’ve shown you some of the raw basics regarding the main features of the interface and how to install your trial. Do you need amazing audio for your video? For the slightly more advanced users amongst us, our plugins for Final Cut Pro X allow you to download and customise royalty free music. Created right here in the UK by our in-house team, you can select an amazing range of ‘SoundStacks’ which will help your video look and sound awesome. For more information about us, head on over to fcpaudio.co.uk and if you want a FREE TUTORIAL to see how it all works simply click here.